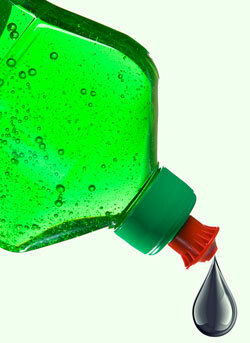 Household and personal products making claims about the sustainability of their ingredients may not be all they seem. According to analysis by US researchers, many such products contain surprising amounts of petroleum-derived ingredients. Researchers at Seventh Generation in Vermont - which makes its own range of household products from predominantly plant-derived ingredients - have been using carbon-14 analysis to reveal the origins of components in liquid laundry detergent, washing up liquid, and hand wash products. Their results - particularly for products making sustainability claims - were quite surprising. If a product contains no carbon-14, its carbon must be entirely derived from fossil petroleum sources - the carbon-14 present when prehistoric forests or organisms last absorbed CO2 from the atmosphere has long since decayed underground. If carbon-14 is present, the percentage can be used to calculate the proportion of plant based, renewable ingredients. Sustainability claims are not currently regulated by the US government - but the team hope that others will adopt the method, which they have registered with voluntary standards agency ASTM. They see it as a tool for validating raw materials and backing up product claims. The team also tested a wide range of products that made no claims about the source of their ingredients. 'We were pleased to note that products making no sustainability claims contained between 28 and 44 per cent non-fossil carbon. Five years ago it was hard to find good naturally-derived raw materials for personal and home care products,' recalls Gebhardt. 'The palette has expanded considerably, formulators appear to be selecting them even when they don't wish to make sustainability claims - which is great news,' she adds.